Does this work with VanillaFix? Yes, it does. 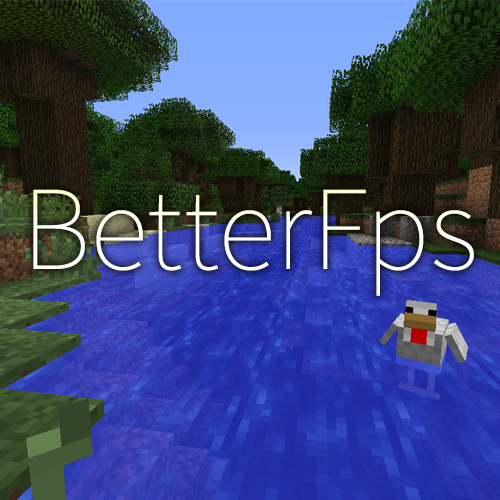 BetterFps, VanillaFix, Phosphor, TexFix, FPS Reducer, FoamFix, and OptiFine (all great performance improvement mods) are all fully compatible with one another. I have “Fast Hoppers” enabled on both my client and the server, but I did a profile for my world’s lag with LagGoggles, and one of my hoppers had over 7,000µs (microseconds) of lag, while another one had over 10,000µs of lag. The rest had a hundred or more. Are hoppers supposed to cause this much lag, even with “Fast Hoppers” enabled? I’m playing the Enigmatica 2 modpack for Minecraft 1.12.2, with the latest version of BetterFps (1.4.8). i can't tell you what the fast hopper option does in betterfps but hoppers are dumb and they constantly cycle their search code, so i wouldnt be surprised if you're still getting lag even with this mod. Meh, I'd switch to 1.12 if I was you. It is generally a better version in my perspective. Please update to 1.13.2 for forge, pls! Hello! Is 1.2.0 really the latest version to support 1.8.9? Hi, Happy new year, is this mod also compatible with 1.13? Hello, it's not compatible because 1.13 Forge is not out yet.